The comedic duo of Keegan-Michael Key and Jordan Peele (Key & Peele) has produced a number of hilarious sketches, but nothing hits my funny bone harder than Obama’s Anger Translator. Poking fun at former president Barack Obama’s coolheaded demeanor, the brief skit introduces us to Luther, Obama’s “anger translator.” Luther’s sole responsibility is to parlay the emotion behind the president’s words. Thus, in place of polished, diplomatic language directed at the president’s foreign and domestic opponents, Luther lets loose some aggressive, profane warnings. The resulting contrast between the calm, seated president (Peele) and the cursing, prancing Luther (Key) is brilliantly entertaining. Perhaps the reason this sketch is so popular (with over 17 million views on YouTube), is because we can all relate to its premise – that our true feelings must often be veiled in strategic dialogue. And unlike Key & Peele’s imaginative world, there’s no such thing as an anger translator…or so I thought. Lamborghini’s fiercest Huracan first rattled my bones in 2017, during a drive event near the Italian automaker’s home in Sant’Agata, Bolognese. 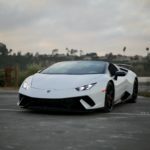 At the time, the Huracan Performante was the fastest production car to ever lap the Nurburgring (its record has since been busted by the new Porsche 911 GT2 RS), owing its pace to an innovative form of active aerodynamics. 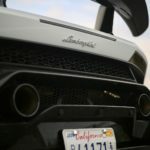 ALA (Aerodynamica Lamborghini Attiva) calls to task a set of integrated air channels that open or clos to add downforce or reduce drag. 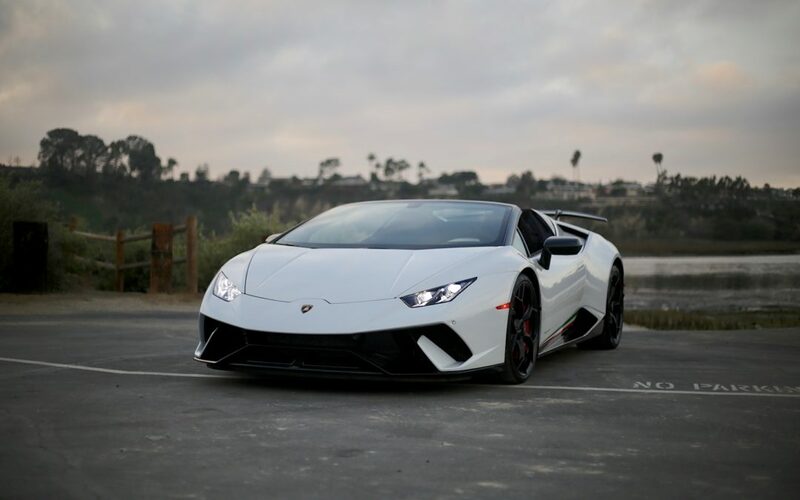 The automatic system reacts in half a second to optimize grip or acceleration, even supplementing brake-based torque vectoring with a 50-50 split of valve operation. On track, the Huracan Performante coupe was astonishing — both in its tenacity and poise. The car’s straight-line speed, corner exit velocity, and high-speed stability reset most of my internal benchmarks for “fast.” While taking laps of Autodromo di Imola, the car’s ferocious exhaust also made an impression, but I was too preoccupied with learning the circuit and exploring the car’s performance to pay the V10 harmony proper respect. 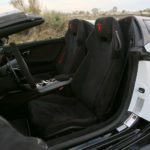 Thankfully, Lamborghini recently extended another opportunity to ride the bull – this time sans roof. 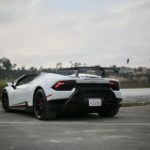 The Huracan Performante Spyder is every bit as weaponized as its fixed roof counterpart. Sporting the same 5.2-liter naturally aspirated engine, the Spyder produces an equal 631 horsepower and 443 pound-feet of torque. 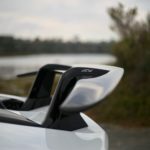 The sprint to 60 mph is within a tenth of a second and top speed is just 1 mph shy of the coupe, meaning a sub 3.0-second run and a 201-mph VMAX. And though few owners will tote their Performante Spyder to the track, ALA remains an effective tool for cornering confidently. Yet another shared element between the coupe and convertible is a titanium exhaust with active baffles. Designed to save weight, the system is also an ideal echo chamber for the mid-mounted V10. Selecting Sport or Corsa drive mode pries open the integrated valves and releases the full fury. 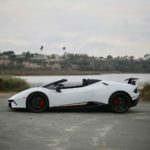 Unlike the coupe, however, the Performante Spyder can fold and stow the only obstruction between is center-exit soundtrack and passenger ears. It’s under such conditions that I’m reminded of anger translation – foolish though it sounds. 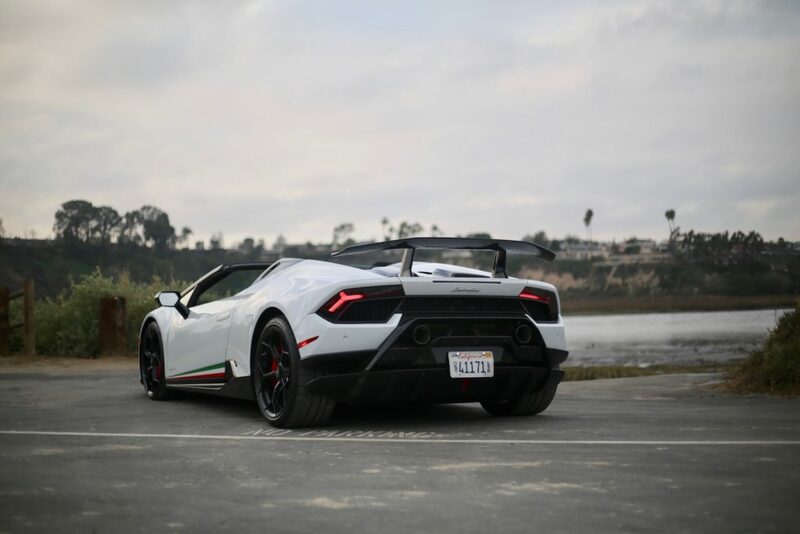 With the top down and engine wailing, the Huracan Performante Spyder is the untempered emotion we all long to express. However minimal or imperceptible, accumulated stress leaves the body with every run up to the car’s 8,500-rpm redline or downshift-induced series of popping overrun. Better yet, unlike Luther’s intended audience, the car’s rage has no victim. Fellow motorists and onlookers beg for more retribution, and I’m happy to comply.